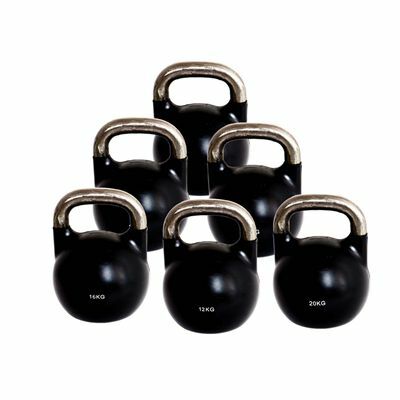 The Marcy 12 to 32kg Competition rubber coated kettlebell set features six kettlebells weighing12kg (26.4lbs), 16kg (35lbs), 20kg (44lbs), 24kg (53lbs), 28kg (61.7lbs), 32kg (70.5lbs). The kettlebells are versatile tools that deliver outstanding results both in cardio and strength training. The steel construction of the kettlebells guarantees durability and the rubber coating protects them and the floor from scratching. The large non-coated handles ensure a good, stable grip and are wide enough to be grasped with both hands. for submitting product review about Marcy 12 to 32kg Competition Rubber Coated Kettlebell Set.